Sri Lanka currently has four excellent golf courses: Royal Colombo, Water’s Edge, Victoria and Nuwara Eliya. The first two are situated in the centre of Colombo, ideal for a half-day escape from the capital’s shopping. The other two, Victoria and Nuwara Eliya, are located in the central highlands and both are stunningly, picturesque. Victoria is spectacular, ringed by ragged mountains and a huge reservoir, while Nuwara Eliya, in the heart of the tea hills, feels like the Scottish Highlands on a misty morning. Golf is, thankfully, quite laid-back in Sri Lanka. Royal Colombo is quite formal – although not by normal Royal standards – but the other courses are delightfully relaxed. Day members are welcome in all four courses and the average cost of a round is around £20 inclusive of green fees, caddy, ball spotters and tips. Clubs can be hired but don’t expect the latest titanium shafts. Hires costs are approximately £5 for a round. Packages are sometimes offered if you want to play on consecutive days. Golfing etiquette in Sri Lanka appears to demand you hire as many people as possible. Your caddy is a must in any case – it is far too hot and humid to be hauling around a bag – but expect ball spotters to be offered. Their fees are small and they do an excellent job. Beware water hazards. “Pond boys” will find your ball within minutes and charge a small fee for their trouble – if you wish, your caddy will handle negotiations. There is rarely a need to book a tee time, except at weekends. Red Dot will do this for you in any case. We recommend you take lots of fluid while on the course and the island’s great energy snack, bananas, will keep fatigue at bay. It is best to avoid the midday sun too as the mornings and afternoons are far more comfortable. 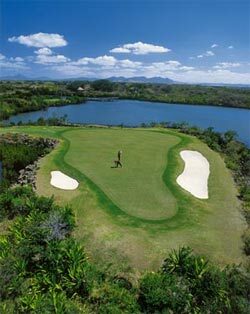 Sri Lanka boasts of having three of the finest 18 hole Golf courses comparable to those in Asia. The three courses are situated in Colombo, Kandy and Nuwara Eliya. The elevations and climatic conditions in each location differ to the extent that some golfers often comment that it is like playing in three different countries.